No other waterpot of this design appears to be published, although there are a number of vessels made to simuate the patina of bronze, while adhering to the theme of archaism which was very much in fashion during the 18th century. 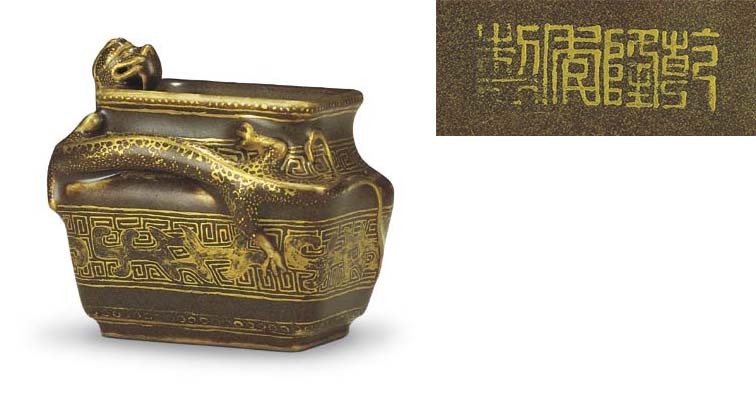 A closely related miniature vase with a similar gold-flecked brown glaze and gilded Qianlong mark, was exhibited at the Arts Club of Chicago, Chinese Art from the Collection of James W. and Marilynn Alsdorf, 1970, illustrated in the Catalogue, no. c76, and subsequently sold in these Rooms, 23 March 1993, lot 750.